Every year we experience incredible and poignant human stories as we welcome and get to know our guests at the Topeka Ronald McDonald House. We asked Kelly Kuntz to share his story about the birth of his daughter Ellie Louise, who was born at 33 weeks by emergency C-section. “A meatloaf half-prepared left sitting on the counter, dishwasher open and partially filled, lights left on, doors unlocked. 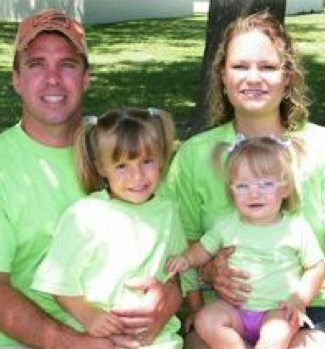 This was how our home in Junction City, Kansas was left on March 8th, 2010 when I received a call from Irwin Army Community Hospital that something was wrong with my heavily pregnant wife and that I needed to get up to the hospital ASAP…. By the Grace of God, my wife, Kyanna, and daughter, Ellie, are here today. The doctor discovered Kyanna had a massive amount of blood loss in her abdomen from an aneurism that occurred in an artery in her spleen. This rare medical condition holds a 95% mortality rate for the unborn baby and a 75% mortality rate for the mother. Our dire situation of need led us to the front stoop of the Ronald McDonald House of Topeka, Kansas. I do not have the ability to express the depth of my gratitude and amazement for the people of the Ronald McDonald House. It is my dearest wish that no one would find themselves in our situation. However if a difficult situation arises, know that you have friends and family at the Ronald McDonald House. When my world was turned upside down and there was nothing but uncertainty and chaos, being able to spend a few hours at the House in comforting warmth and understanding was a Godsend. I spent the first week alone at the Ronald McDonald House while my wife was recovering from her surgery and while Ellie was in the NICU. When I arrived I was greeted with the warmest smile, given a tour of the property, shown my room and I sat down to eat the first of many fabulous home-cooked meals. I was in awe. It was the most difficult time of my life; where I had not given one thought as to where I was going to stay, sleep, eat, shower, or cry and these people were telling me that all of this was going to be provided for me and for my wife when she was released from the hospital. I was completely overwhelmed by the generosity of this organization. Having someone to talk to like the House Manager and all the rest of the fine staff and volunteers was wonderful. I’m not generally one who randomly has conversations with other people, but I found myself unloading my worries and concerns onto them and they empathetically offered a smile and said the right things back to me. The staff had thought of everything and we wanted for nothing. We ate home-cooked meals day and night prepared by volunteers and the community. An indoor & outdoor play area was available for our daughter Clare when she visited. Computer access and internet kept us up-to-date on our medical jargon and my wife was able to support our struggling baby by pumping and storing breastmilk in the freezers provided. We had all the kitchen supplies needed to eat as opposed to eating-out and comfortable dining and living rooms to relax and unwind.